My posts have been very long. I am usually quite wordy when I write something, and I don’t know if that is a good thing or not. I have been up way too late recently, sometimes writing blog posts, sometimes doing other things, but I need to get to sleep earlier. In that vein, I am going to attempt the impossible: to write a post in under twenty minutes so I can still get to bed before midnight! It is 11:38 right now. “I’m getting dressed.” He responded, in a bit of a snippy tone. “What time is it?” He asked, sounding frustrated. “Many years.” I said to him, with no air of sarcasm. In Jewish tradition, the soul of every Jew–dead, living, yet to live, and even those who would convert–was present at Sinai. Every Jew heard the declaration from Hashem (G-d), and accepted the covenant there. In a way, it had been only a month, a week, a day. 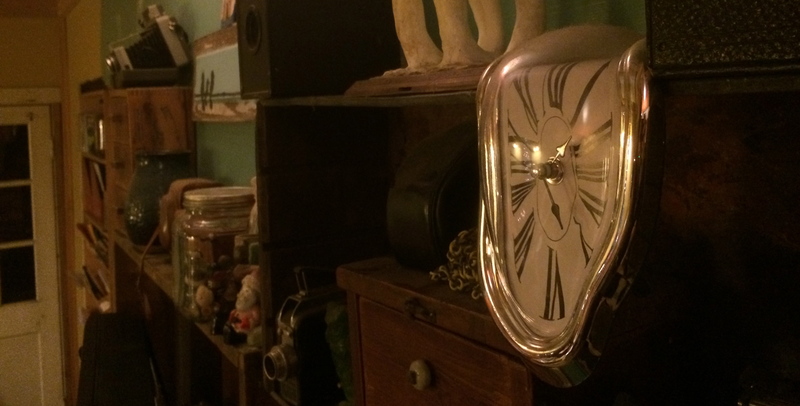 What is time, anyway? Time doesn’t really exist, except in our minds. Time is a system of measurement that gauges our productivity in this world. In fact, if not for the fact that we live within a society that demands that we give our time to it, we would have no need for it. My son, when he awoke in the middle of the night, heard me awake downstairs and assumed that it was time to get up for the morning. He had been a little under the weather the previous day, and so he had already slept a lot. When he woke up, he must have been fairly rested, therefore it must have been morning. Where does time come from? Where does our need to set time come from? In Judaism, the earliest example of time known to man comes from the dictate from G-d to set holy days, and to call off the seasons and months. We are to usher in rosh hodesh (the head of the month) with trumpets. Rosh hodesh, in fact, is a minor holiday in Judaism…something that most jews–I think–either forget or never knew. We are also commanded to bring offerings at particular “seasons” of the day, if you will. There is a dictate to bring the morning, afternoon, and evening offerings. Our prayer times are set around these three offerings, and the dictate to twice a day recite the words of the shema, “love the Lord your G-d with all your heart, all your soul, and all your capacity,” etc, in Vayikra (Leviticus) and Devarim (Deuteronomy). This is to be recited, “when you lay down, and when you rise,” and so there are certain times to do this which correspond to the appropriate times to bring the offerings of morning and evening. So what of time? Time cannot be seen, touched, tasted, smelled. Time can be quantifiable–is quantifiable–yet we can never make more of it. In fact, it is such a finite resource for us, that we often feel loathsome toward the prospect of “burning” time. But how can we be so concerned with losing time, that we drive ourselves insane? Perhaps it is because we have attempted to take that which is inconceivable, and ineffable, and put it in a box. But with all our gears, and levers, the only thing that we can actually measure is our place within time, as it wends its way around our collective consciousness. It is 12:37 now. I am 38 minutes “late.” I have not made my goal of time. I have not, however, finished late. Neither do I ever finish my tasks early. I finish precisely when I am meant to. Is time as it seems? What is a thousand years to a soul? it does not even know the necessity for such things. A heart is but a pound of flesh. What is time to the heart? Why Wait? Live in Heaven Today! A Day in Belfast…An Eternity in the Soul….